Former Mini design boss Gert Hildebrand is working to provide “distinctiveness in styling, but also in brand values and differentiation” at China's newest carmaker, Qoros. Chinese carmakers want to reach styling and quality milestones already achieved by their Asian rivals – but in a fraction of the time. To do this many Chinese brands have hired experienced Western design directors who they hope will make their products ready for the world. The list of European and American car stylists who have moved from mature Western brands to fledging Chinese companies is long and impressive. • Great Wall Motors, China's biggest maker of SUVs, appointed former Mercedes-Benz designer Andreas Deufel as design director last year. 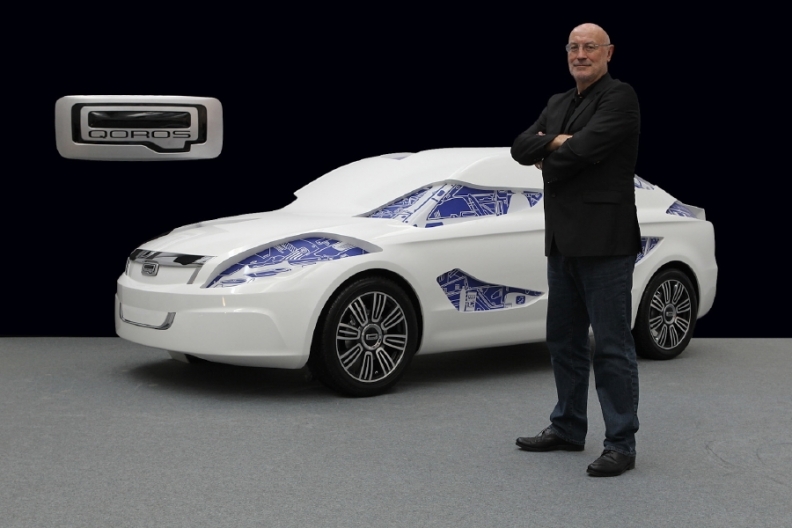 • Former Ford, General Motors and DaimlerChrysler designer James Hope was named corporate design director at Chery Automobile in January 2012. • Former Volvo Chief Designer Peter Horbury joined Zhejiang Geely Holding Group as senior vice president in charge of design last year. • Longtime GM designer Dan Darancou joined design consultancy CH-Auto in 2010. • Qoros Auto, a joint venture between Chery Automobile Co. and Israel Corp. that plans to introduce a luxury sedan for China and Europe next year, hired former Mini chief designer Gert Hildebrand in January 2011 to head its design team. Hildebrand says he is working to provide "distinctiveness in styling, but also in brand values and differentiation," and has surrounded himself by executives who have experience working for European manufacturers and suppliers. Much of the German executive's team has previously held positions at the Volkswagen Group and BMW Group in Germany. Chinese automakers are not only looking to the designers to make their cars more aesthetically pleasing. They also want them to help improve their build quality so that their models can be exported to worldwide markets. Hildebrand aims to give the Qoros brand a distinctive design face, with a large Q logo positioned in the middle of a black grille. The Q stands for quality. Said Great Wall's Deufel: "Chinese carmakers want to improve dramatically on the quality of their products. There are plenty of experienced designers from the Old World who can help them do this." The German worked at Mercedes-Benz for 15 years prior to moving to China and joining TGI, the largest vehicle developer in the country. He cited the difficulty in achieving the quality levels he desired due to the pace at which the Chinese industry is moving. "If we developed a Mercedes product during my time there it would take 3.5 years. Here we can do that in the quarter of the time," Deufel said, "We need to understand what can be cut out and the compromises we need to make." North Americans Hope and Darancou have also spent their entire careers acquiring a wealth of knowledge of design processes in established markets. "Ultimately the goal of all these companies is to become exporters," said Darancou, a 25-year GM veteran. At CH-Auto he manages the design practices of the more than 90 automotive brands that have sprung up in China in just over a decade. "Once they're able to export it will force them to adopt much higher quality standards, more international acceptance in terms of their design, brand character and all of the things that took other car companies 40 to50 years to create." With the multitude of disparate brands all vying for market share in China, brand strategy and direction are two of the main areas the Chinese carmakers need to improve, as well as perceived quality, the designers say. "When you look at the products now and where they need to be in the global market, there's certainly an opportunity to have a big influence on change," says Chery's Hope. His main objective is to enhance perceived quality and develop a cohesive brand identity for Chery and the carmaker's four sub-brands – Cowin, Karry, Rely, and Riich. "We have a lot of brands and a lot of product for each brand," said Hope, who is actively pushing to consolidate the number of brands and raise quality levels and volumes of successful models to keep plant capacity consistent. Both Hope and Darancou share the view that the number of brands in China is too high, and that consolidation is inevitable. "The bigger players are going to start to produce a really strong brand character, they're going to buy up assets that represent niches in their portfolio in order for them to really become global players," said Darancou. "To get serious in terms of their perception in the marketplace they're seeking an international team of experts."